Lake James State Park is a North Carolina state park in Burke and McDowell Counties, North Carolina in the United States. Located near Nebo, North Carolina, it covers 3644 acre and borders 6510 acre Lake James. Lake James State Park offers a full menu of activities. Along with boating, swimming and fishing in the beautiful, clear waters of the 6,812-acre lake, there are 25 miles of trails, 15 of which are open to mountain biking. Trails vary from the short, educational Holly Discovery Trail with child-friendly activities, to the more adventurous, historic section of the Overmountain Victory Trail. There are three campgrounds. 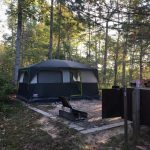 The Catawba River Area (located at 2785 NC-126 in Nebo) has 20 walk-in campsites, many of which offer lake views. The Paddy’s Creek Area (located at 6883 NC-I26 in Nebo) has 33 drive-to, family-friendly campsites. 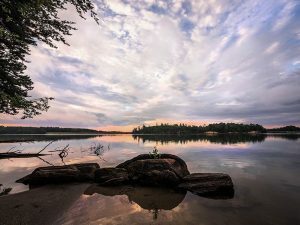 The remote boat-in campground on the Long Arm Peninsula offers a true outdoor adventure for those willing to paddle or steer their canoes, kayaks or powerboats to their own slice of heaven. Boat ramps at Hidden Cove and Canal Bridge on NC 126 are located between the park’s two day-use areas. And, canoe, kayak and paddleboard rentals are available at the Paddy’s Creek Area concession stand from May through September.